There are just 14 hours (and counting) to secure trial memberships with 3 top-rated football tipping services before our deadline expires at Midnight this Saturday. Simply sign-up for a new Smart Betting Club membership today and you can enjoy 2 free trials (for 30 and 60 days respectively) with 2 proven football tipster experts…plus the ability to follow a top live football betting tipster for just £1 a day this weekend. The 2 free trial memberships alone would usually cost £94.98 combined, yet in this special deal for new SBC members, you can get them for free! The instant you sign-up as a Smart Betting Club member, we will send you details on how to claim your trials. This offer expires midnight tonight so be quick! If there is one thing we are known for at the Smart Betting Club it’s our Hall of Fame of the best tipsters to follow – effectively those proven to make you money betting. 1. How Much Money Will It Make You? 2. How Much Time Will It Take? 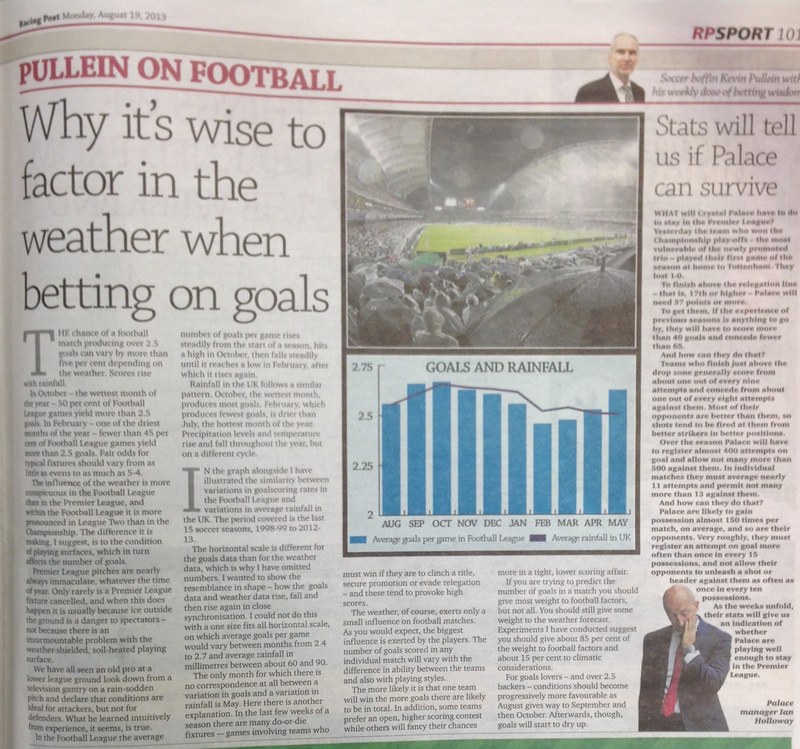 We have a special guest blog piece to share with you today from expert Scottish football tipster and scout – Greg Gordon, discussing the findings of a recent article by The Racing Post’s football guru – Kevin Pullein. Greg has a proven record of making money from betting on Scottish Football dating back several seasons and is a renowned expert on the subject. 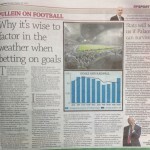 One of my members has just sent me a copy of a Racing Post article by the Post’s ‘esteemed’ number-crunching columnist Kevin Pullein on the relationship between rain and goals in games. Click the image below to view the original article in full. Sadly, like a lot of Mr Pullein’s grand generalisations it is likely to send many punters down the wrong track even though on closer inspection this rain analysis, if you’ll pardon the pun, really doesn’t hold much water. Rather, I think this is a situation whereby Kevin Pullein, with lots of column inches to fill each week, has fallen in love with his findings and become determined to find a conclusion, whether a conclusion can be found or not. And that is always dangerous territory for betting judgements. Here at the Smart Betting Club, not only do we review and report back upon all the best tipsters, but we also regularly negotiate special trials and money saving deals with them on your behalf. And to celebrate the release of our new season Football Tipster Guide, we have wangled 3 amazing deals with 3 of our highest-rated football tipsters (including 2 free trials) that you really won’t want to miss out on! Access to the fantastic live-betting tipster service from ex-pro footballer Goran Trpevski for only £2 this weekend (24/25 August). It’s been a long hard summer for us football fans, with good betting opportunities few and far between, yet finally the beautiful game returns in full this Saturday with the start of the English Premier League. Before you place any bets this weekend, I wanted to share with you our 8 Top Football Betting Tips (as put forward by a variety of punting experts) to help you bash the bookies. Each tip has been compiled based on the advice supplied by the football experts interviewed in our recently released 2013/14 Season Football Tipster Guide. Doing what everyone else is doing can often be a pointless exercise and some would go as far as suggesting that you can’t make money in the long run backing “popular” bets. It might be psychologically re-assuring to read lots of people agreeing with a bet you fancy, but in reality the fact that lots of people want to back something means you are unlikely to be getting a value price. Today I want to talk about a ‘dirty’ word when it comes to betting: Arbing. Arbing is effectively picking out a set of bets where you can lock in a profit, regardless of the outcome of an event. Its loved by punters but hated by bookmakers alike due to the easy profits that can be made by using an effective arbing system. So with helping SBC members make ‘easy profits’ in mind, you can imagine our interest when we got in touch with one shrewd punter who had developed a very unique arbing system that we were looking to acquire. It took advantage of a massive (and still ongoing) loophole in one bookmakers system, which was allowing for easy profits to be made by its author. It had made him a few £1000 pounds in the space of a few months so were very keen to obtain a copy for our members. The upshot is that after much negotiating, we were given permission to publish this unique arbing system in our most recently released SBC Magazine. Although I can’t reveal its exact methods here for free (as part of our agreement with its author – we can only share it with SBC members) we did perform an interview that reveals a fair bit about how it works. It should hopefully provide a bit of insight into why this arbing system works, how it was discovered and how you can use it as inspiration to find your own arbing system…. When it comes to making a profit betting…it’s fair to say there are many different ways to skin a cat. This is certainly the case when it comes to the hundreds of tipsters we proof and monitor at the Smart Betting Club as each has a slightly different approach to making their betting pay. Whether its backing at short or long prices, betting 20 times a day or 20 times a month, it often matters little. What does matter is if a tipster can make you a profit as that, after all…is what we really care about! This point is no better proven than with the two very different tipsters we reviewed in the latest SBC Magazine, which was released a few days ago. One is a football tipster, the other a racing tipster and both are profitable but in very different ways.